NYFF review: "Bridge of Spies"
It's easy to see what attracted Joel and Ethan Coen to work on the screenplay for the espionage drama "Bridge of Spies," a true-life Cold War thriller originally penned by British playwright Matt Charman. The irony of a lawyer who typically defends insurance companies being recruited to broker a prisoner exchange between the U.S. and the U.S.S.R. in the no-man's land of East Berlin, and the cynicism that appears to corrode most everyone around the story's protagonist, James Donovan (Tom Hanks), is right up their alley. It could have made for a very good Coen Brothers film. In 1957 Donovan, a Brooklyn-based lawyer whose resume included serving as a prosecutor's assistant during the Nuremberg trials, is handed the thankless job of defending Rudolf Abel (Mark Rylance), a foreign national arrested for passing secrets to the Soviet Union. Donovan's defense of Abel brings the fear and discord of the Cold War '50s to his doorstep, even endangering his children, who are busy having their heads filled with nuclear horrors of impending missile attacks. Abel's conviction may be a forgone conclusion, but Donovan gives it his all, and then some. In short order, Francis Gary Powers, an Air Force pilot who'd been recruited into the government's secret surveillance program, is captured by the Soviets after his U-2 spy plane is shot down over Russia. His conviction for espionage a forgone conclusion, he is interrogated for information and held up as a public embarrassment. Washington wants him back, and is willing to barter one spy for another. This is where Donovan's insurance background comes in handy, by playing up the contingencies -- each government is trying to insure that their guy won't break under questioning, or insure that the next spy captured down the road won't break. Like a high-stakes poker game, they are also betting that the other side won't presume their man has already talked, or else the captive's value would be nil. By this token, Rylance (a three-time Tony Award-winner) gives the film's stand-out performance in part by doing so little -- his stillness and taciturn demeanor in the face of so much hot-blooded vitriol, international brinkmanship, and a looming death sentence is riveting. There is much about Abel that remains a cipher, even when the jig is up. This is Hanks' fourth time working with Spielberg (after "Saving Private Ryan," "The Terminal" and "Catch Me If You Can"). In his familiar role as Hollywood's consummate Everyman figure, Hanks upholds the movie's message that we all (FBI and CIA included) must act by the rules of the Constitution, and that the legal protections it promises are to be shared by all, even those who would do harm to our country. But he's also a softy, and finagles his negotiations to include a young American graduate student, Frederic Pryor (Will Rogers), who was picked up by East German police for being in the wrong place at the wrong time. Washington and Moscow don't particularly care about kids writing Ph.D. dissertations on economics, but Donovan does, and threatens to upend the entire deal if Pryor isn't freed as well. Cynicism, you lose. 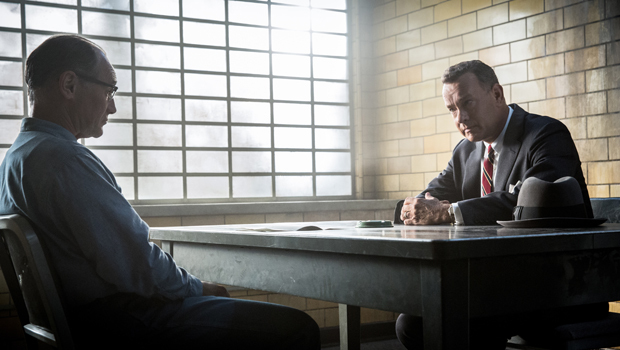 "Bridge of Spies," distributed by Touchstone Pictures, opens October 16. Rated PG-13 (for some violence and brief strong language). 135 mins.